In yesterday’s post I wound up discussing, as Andrea Subisetti called it (thanks for the repost Andrea), the relevance of the horror host. Horror hosts on television got their start in 1954 with Vampira in Los Angeles. 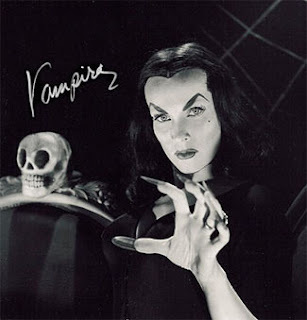 There is some question if Vampira was the very first host, but for my money she’s the one that counts, especially considering her show was broadcast in the LA area and therefore much more influential than any other contenders. The horror host is a natural extension of the old radio host programs such as LIGHTS OUT And SUSPENSE, where a mysterious announcer would introduce the evening’s offering of chills and thrills. The radio hosts were influenced in turn by the comic book hosts of companies such as EC Comics with their books TALES FROM THE CRYPT, VAULT OF HORROR, and HAUNT OF FEAR, hosted by the Crypt Keeper, the Vault Keeper, and the Old Witch respectively. I say local horror host because that is where horror host works best, on the local level. 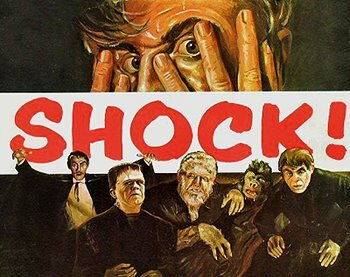 In every city where a host introduced the SHOCK! package a community of devoted fans developed almost overnight. Kids latched onto their show and the hosts became local celebrities. The programs became the talk of the water fountain at school and their shows were a can’t-miss event. Ratings soared and in most cities these shows were the highest rated programs on the station. There were many, many pioneers of this tradition of horror hosting – the most comprehensive list of horror hosts past and present is the amazing website Ygor’s Chamber of TV Horror Hosts, run by George Chastain. If you ever wondered if your area had a horror host, check his site! I’d be remiss if I didn’t add my own host to the list, even if only in a runner-up position. Sir Cecil was my own horror host in Nashville TN. 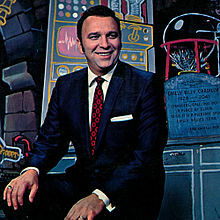 His show, CREATURE FEATURE, ran on the air from 1970-73, and he revived his show for a couple of years in the 1980s on TNN, The Nashville Network, although this time around the show was called THE PHANTOM OF THE OPRY. I actually didn’t get to watch CREATURE FEATURE– my parents wouldn’t let me stay up and see it. But I caught the promos for it and met him once at a Boy Scout event. I even got a patch at that event that reads “Sir Cecil’s Ghoul Patrol.” First thing I did when I began my show was to sew that patch onto my labcoat in tribute to Sir Cecil. Host of Chiller Theater in Pittsburg, PA. The show ran on the air for 20 years in the Pittsburg area. Bill appeared in the George Romero classic film Night of the Living Dead as a TV news reporter. I’ve met Bill and he is a truly nice guy, and a true legend in the horror host field. 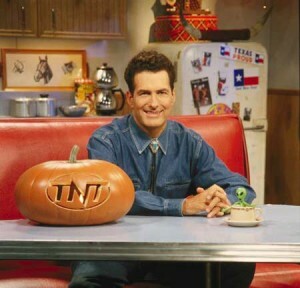 Joe Bob was the host of JOE BOB’s DRIVE-IN THEATER on The Movie Channel for ten years and later MONSTERVISION on TNT for four years. Both were, of course, nationally syndicated programs. Joe Bob has one of the funnier schticks around, a redneck lowbrow lover of b-movies and drive-in theaters who employs a ratings system of three B’s (blood, breasts, and beasts) for his movies that is actually very smartly written. He has appeared in a number of movies and television shows and has written several books. He also went to Vanderbilt University, giving him a Nashville connection. Dr. Paul Bearer was the host of SHOCK THEATRE, CREATURE FEATURE and FRIGHT THEATRE. 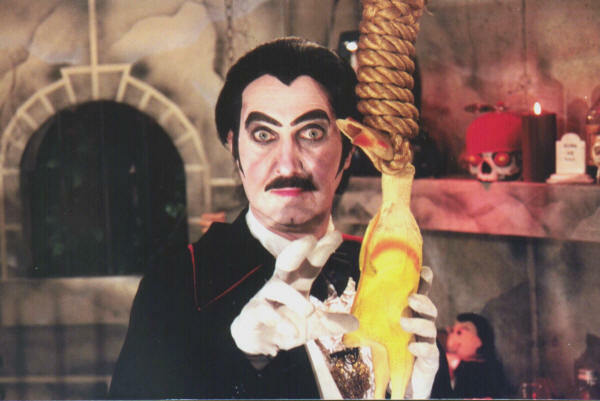 He began hosting as Count Shockula in 1965 but changed his persona to Dr. Paul Bearer along the way. He hosted until 1995, originally in North Carolina but he later moved to Tampa, FL. Dr. Paul Bearer was famous for his use of puns and fake product placement. He spoke in an almost monotone voice that he called reverse falsetto. Sammy Terry hosted Nightmare Theater in Indianapolis, IN for close to 20 years in the 60s and 70s then off and on afterwards. He was and still is a fixture in the Indianapolis area, drawing large crowds at signings and events. 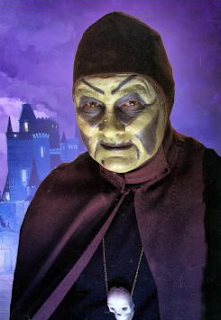 Mention Sammy Terry to anyone from that area and their eyes will light up immediately!! The Count hosted CREATURE FEATURE in Washington D.C. from 1973-87. In 1998 he revived his show on the internet in a weekly web series (the year before I began my own show – I met Gore for the first time in 1999, and we became fast friends). Almost 35 years later he’s still going strong, and has been influential to a new generation of horror hosts who followed his lead into the digital age of horror hosting on the internet. #8 – Big Chuck and Lil’ John – real names Chuck Schodowski and John Rinaldi. The duo hosted the BIG CHUCK AND LIL’ JOHN SHOW in Cleveland, Ohio from 1979 to 2007, an incredible 28 years! BUT, the show dates back much longer than that - it originally began as THE HOOLIHAN AND BIG CHUCK SHOW in 1966 with Chuck Schodowski and Bob Hoolihan, a weatherman on the station, bringing the total number of years the program ran in Cleveland to an amazing 41 years straight!! Svengoolie is the host of a self titled program in Chicago, IL. 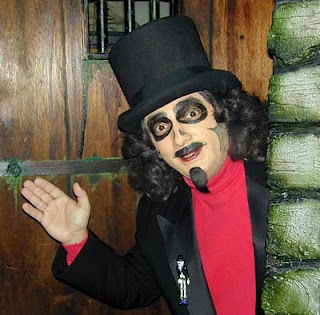 Svengoolie started his show in 1979 as Son of Svengooli , taking over the role of Svengoolie from former host Jerry G. Bishop (his show, SCREAMING YELLOW THEATER, ran from 1970-73). Jerry is one of my all-time favorites as well. He was quick witted and funny with a really natural sense of humor. The Son of Svengoolie show ran from 1979-86, then returned in 1994 on another channel (WCIU) where it continues to this day. Rich shortened his name to simply Svengoolie and the rest is history. Sven is easily my favorite current horror host. 25 years on the air and counting and he’s still going strong! 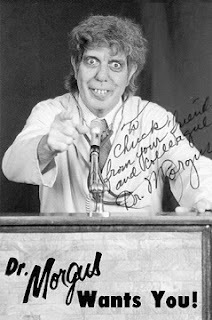 Dr Morgus is the host of THE HOUSE OF SHOCK and DR. MORGUS PRESENTS! in New Orleans, Louisiana. He started his program in 1959 and it ran until 1989, then was resurrected in 2005 and reruns continue to this day. Dr. Morgus is a mad scientist who conducted mad experiments each week between breaks in the movie. It was my pleasure to induct him into the Rondo Award Hall of Fame last year. Okay, I know it isn’t fair to lump two hosts together but hey, it’s my countdown, so I make the rules here!! Bob Wilkins hosted CREATURE FEATURES in San Francisco from 1971 to 1978. 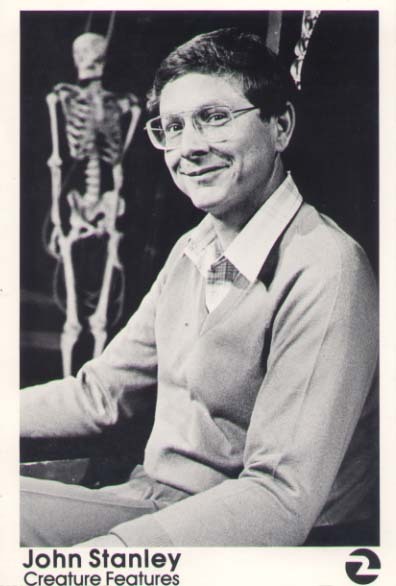 John Stanley then took over host duties from Bob Wilkins and continued the program until 1984. 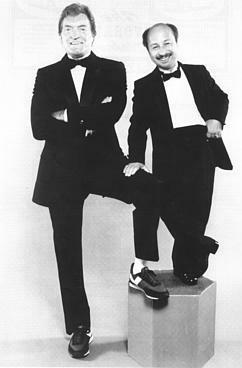 Both hosts were non-costumed, appearing as themselves to introduce the movies wearing a suit and tie. Bob always had a trademark cigar in hand while hosting. 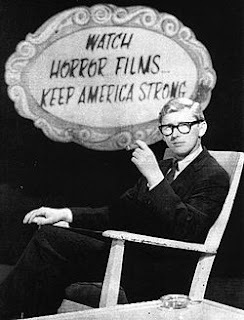 Together the two kept their motto alive, “Watch Horror Movies, Keep America Strong.” Bob Wilkins was inducted into the Rondo Award Hall of Fame in 2008. 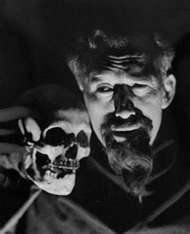 Ghoulardi hosted Shock Theater in Cleveland Ohio from 1963-1966. While his run on the show wasn’t that long his impact was enormous. Ghoulardi was a hipster beatnik who appeared in trademark goatee and moustache. His show was the predecessor to Hoolihan and Big Chuck, who took over after he left. 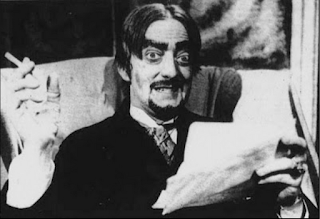 Music played an important part in THE GHOULARDI show, and they made especially good use of PAPA-OOM-MOW-MOW. He would blow up models and items sent in from viewers with fireworks, BOOM-BOOms he called them, live on the air. He had an irreverent air and defiant sensibility that kids immediately latched onto. Ghoulardi rocked the airwaves of Cleveland and is still remembered fondly to this day. Vampira hosted THE VAMPIRA SHOW from 1954-1955. This will probably be the most controversial pick of this list, but despite her being recognized as the first horror host I ranked her #3 because her show was so short lived and so little of it exists (just a few minutes of footage that surfaced a few years back). She drew inspiration for her character from Morticia Addams of THE ADDAMS FAMILY cartoon. Skin-tight long black dress, impossibly thin waist and long jet black hair and nails were her trademark, and she would open every show with a blood curdling scream! She is perhaps best remembered nowadays for appearing in the Ed Wood film PLAN 9 FROM OUTER SPACE. Vampira was inducted to the Rondo Award Hall of Fame the very first year, 2002. Elvira is perhaps the most widely recognized horror host alive today. Vampira might have done it first but Elvira certainly did it bigger! Anytime I need to explain my show to someone unfamiliar with horror hosting I mention Elvira, Mistress of the Dark. Her show, MOVIE MACABRE, was nationally syndicated from 1981-1987. She became an inter-national celebrity, appeared in commercials for national products and was a Halloween icon throughout the eighties. A series of Movie Macabre episodes were released on home video in the late eighties and she revived her show in 2010. 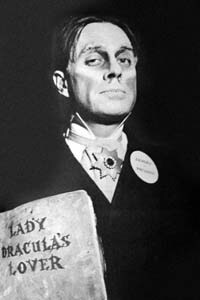 Zacherley, the cool ghoul, was the host of SHOCK THEATER, ZACHERLEY AT LARGE, CHILLER THEATER. Zacherley is the epitome of a TV horror host. If you looked up the term in an encyclopedia, if such a thing existed any longer (dating myself here), Zacherley’s picture should be the one next to the description. Zacherley began his hosting career in 1957 as Roland, host of SHOCK THEATER in Philadelphia. In 1958 he moved to New York City and changed his host name to Zacherley. 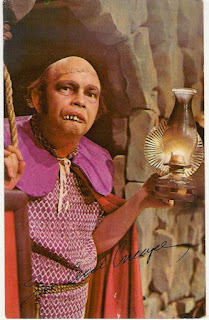 He was wildly popular and his personal appearances drew thousands. He was the first to use “cut-ins”, inserting himself into the movie as if he was part of the action, a standard trick for horror hosts thereafter. Zacherley was inducted to the Rondo Award Hall of Fame the very first year, 2002.